The Kirin in Japanese, qilin (in Chinese: 麒麟; pinyin: qílín) is a mythical hooved chimerical creature known in Chinese and other East Asian cultures, said to appear with the imminent arrival or passing of a sage or illustrious ruler. It is a good omen thought to occasion prosperity or serenity. It is often depicted with what looks like fire all over its body. It is sometimes called the “Chinese unicorn” when compared with the Western unicorn. The Japanese kirin looked more like the Sin-you lion-like beast. Some later Japanese netsuke portray a Kirin that has wings that look like the Central Asian winged horse with horns or the Sphinx. Or they become increasingly dragon-like like Chinese Qilins. 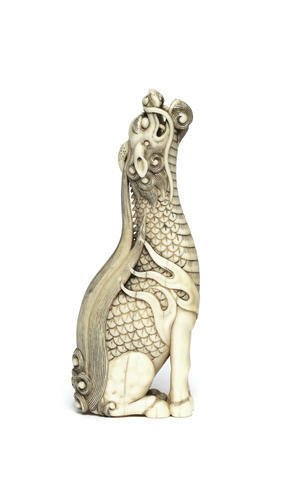 The Kirin / Qilin can sometimes be depicted as having a single horn as in the Western tradition, or as having two horns. In modern Chinese the word for “unicorn” is 独角兽(Traditional 獨角獸) “du jiao shou”, and a Qilin that is depicted as a unicorn, or 1-horned, is called “Du jiao Qilin” 独角麒麟 (Traditional Chinese: 獨角麒麟) meaning “1-horned Qilin” or “Unicorn Qilin”. However, there are several kinds of Chinese mythical creatures which also are unicorns, not just Qilin. Qilin generally have Chinese dragon-like features. Most notably their heads, eyes with thick eyelashes, manes that always flow upward and beards. The bodies are fully or partially scaled, though often shaped like an ox, deer or horse’s, and always with cloven hooves. In modern times, the depictions of Qilin have often fused with the Western concept of unicorns. 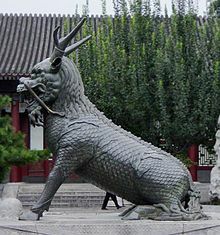 The earliest references to the qilin are in the 5th century BC Zuo Zhuan. The qilin made appearances in a variety of subsequent Chinese works of history and fiction, such as Feng Shen Bang. Emperor Wu of Han was said to have captured a live qilin in 122 BC. According to ancient Taoist time period lore, although they can look fearsome, Qilin only punish the wicked, thus there are several variations of court trials and judgements based on Qilin divinely knowing whether a defendant was good or evil, and guilty or innocent, in ancient lore and stories. The Eastern unicorn was depicted as a solitary animal, believed to have sprung from the center of the earth, the first and most perfect of the 360 land creatures. The Eastern unicorn always reached its destination, never falling into pits or traps, so it was honored as a great spiritual guide through life. In Buddhist influenced depictions, they will refuse to walk upon grass for fear of harming a single blade, and thus are often depicted walking upon the clouds or the water. As they are divine and peaceful creature, their diets do not include flesh. In legend, the Qilin became dragon-like and then tiger-like after their disappearance in East Asia and finally a stylized representation of the giraffe in Ming Dynasty. The identification of the Qilin with giraffes began after Zheng He‘s voyage to East Africa according to recent scholarship. The modern Japanese word for giraffe is also kirin, which bears the same derived ideas. “The Japanese unicorn, is an important part of oriental culture. Here the unicorn plays different roles and could appear as the gentle kirin, as the k’i – lin, or the sin – you. The kirin and the k’i – lin, normally shy creatures, taking large detours to avoid confrontation, have a similar gazelle-like appearance and are solitary animals who walk with measured tread, though some say the k’i-lin skips. The male is called the k’i, while the female is the lin. Although it had different forms. its eyes were always intent and piercing. In contrast the sin – you looks like a lion, being thick-maned, tawny, and fierce, with a single horn. The Sin-you unicorn was not as timid as its brothers and known for its ability to know right from wrong was often called upon to determine the guilt or innocence of individuals. If an individual was determined to be guilty, the Sin-you would fix its eyes upon him and pierce the guilty person with its horn. The Japanese Sin-you unicorn was especially associated with the idea of guilt and justice (see Japanese Unicorns ). It was typically depicted as a sinewy animal that looked much like the lion (as in the photo above). The Kirin, which often appears tiger-like in artwork (see photos below), is a different creature entirely from the White Tiger. The Kirin is said to have the body of a deer, the tail of an ox, the hooves of a horse, a body covered with the scales of a fish, and a single horn. The Kirin appears only before the birth or death of a great and wise person. Said to live in paradise, the Kirin personifies all that is good, pure, and peaceful; can live to be 1,000 years old. “The Japanese art tends to depict the kirin as more deer-like than in Chinese art. 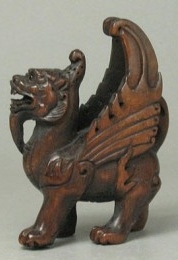 Alternatively, it is depicted as a dragon shaped like a deer, but with an ox’s tail instead of a lion’s tail. The Kirin Brewery Company, Ltd., is named after the animal and uses a picture of one in its labels. They are also often portrayed as partially unicorn-like in appearance, but with a backwards curving horn. 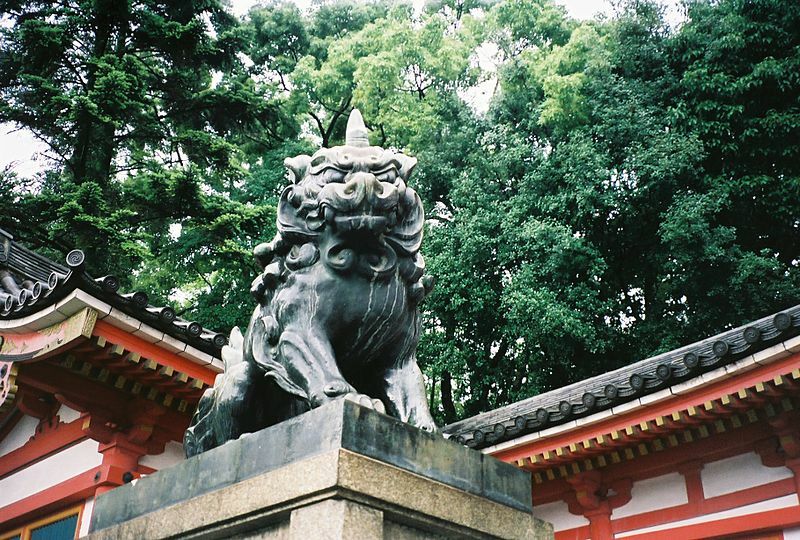 In the Post-Qin Chinese hierarchy of mythological animals, the qilin is ranked as the third most powerful creature (after the dragon and phoenix), but in Japan, the kirin occupies the top spot. This is following the style of the ancient Chinese, as qilin was ranked higher than the dragon or phoenix before the Qin dynasty. During the Zhou dynasty, the qilin was ranked the highest, the phoenix ranked second, and the dragon the third.” — “The Kirin: a mythological beast that portends happiness”. Kirin Brewing company. According to North Korean tradition, Kiringul (Korean: 기린굴; “Kirin’s Grotto”) is a cave in North Korea said to have been the home of the kirin, a mythological chimeric beast that was reputedly ridden by King Dongmyeong of Goguryeo in the 1st century BC. Yasaka Shrine (八坂神社 Yasaka-jinja? ), once called Gion Shrine (祇園神社 Gion-jinja? ), is a Shinto shrine in the Gion District of Kyoto, Japan. Situated at the east end of Shijō-dōri (Fourth Avenue), the shrine includes several buildings, including gates, a main hall and a stage. Initial construction on the Shrine began in 656. The Shrine became the object of Imperial patronage during the early Heian period. In 965, Emperor Murakami ordered that Imperial messengers be sent to report important events to the guardian kami of Japan. These heihaku were initially presented to 16 shrines; and in 991, that composite list of shrines included by the Gion Shrine, ie Yasaka Shrine. From 1871 through 1946, Yasaka Shrine was officially designated one of the Kanpei-taisha (官幣大社), meaning that it stood in the first rank of government supported shrines. In 869 the mikoshi (divine palanquin) of Gion Shrine were paraded through the streets of Kyoto to ward off an epidemic that had hit the city. This was the beginning of the Gion Matsuri, an annual festival which has become world famous.